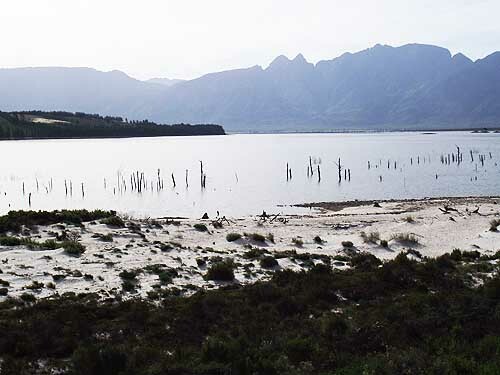 In the Western Cape we have a number of dams that supply water to our region. 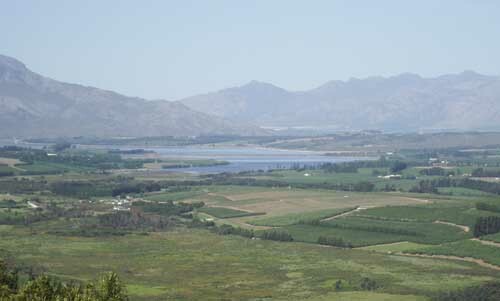 The largest dam in the system is the Theewaterskloof dam near Villiersdorp. It is also the 7th largest dam in South Africa. 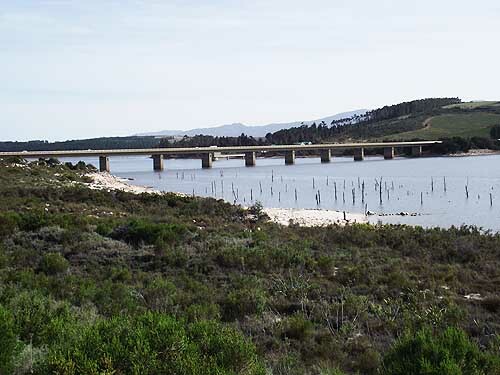 It was officially opened on the 24th of April 1982 as a backup to the water supply for Cape Town and surrounds. This has however changed with the ever increasing demand for water from the city of Cape Town. 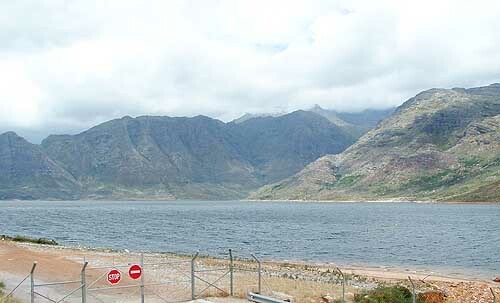 The Theewaterskloof dam is linked to Franschhoek's Berg River dam by an 18 kilometre tunnel through the Franschhoek mountains. 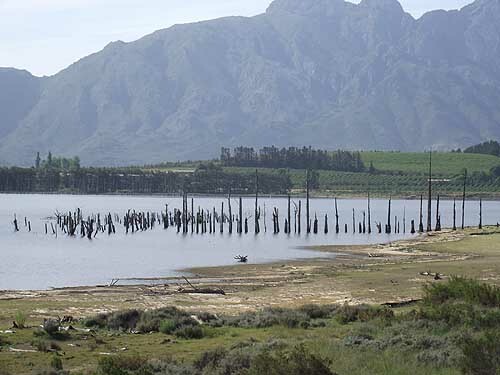 In fact both dams get their water from the Franschhoek mountain range except that the Berg River dam gets its water from the run off of the western slopes while Theewaterskloof gets its water from the eastern sides. It's incredible if you see the size of the dams to think so much water runs off one mountain. The dam has a capacity of 483 million cubic metres of water when full. What is interesting with regards to the tunnel system through the mountain is that water can be transported both ways through it. 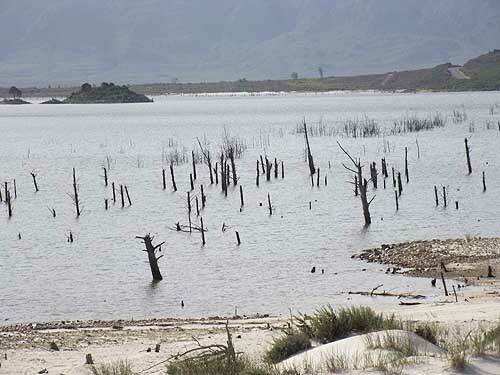 The reason for this is that when there is excess water in the Berg River dam it can be pumped into the Theewaterskloof dam which has a bigger storage capacity than the Berg River Dam. 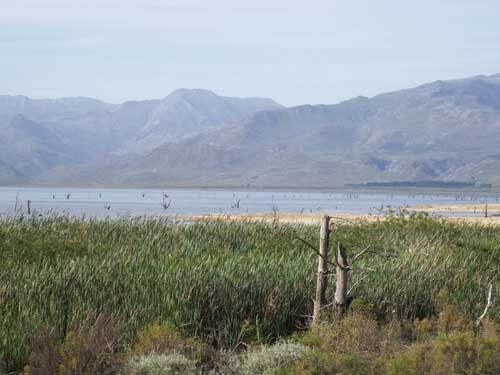 Theewaterskloof dam not only supplies water to the Western Cape but it also provides entertainment to those who love water sports. The dam is stocked with large mouth bass and is a fisherman's dream. It has flooded farmland, standing timber, stump fields, weeds, bushes, buildings, ruins, roads, tracks river channels, rip-rap and rock piles under its water and these are where you will find the fish. The problem is that you need to know where these obstacles are to be able to find the fish. Most fishermen at the dam use boats but if you can find a few steep drop offs along the side of the dam you can still catch fish. There are not only large mouth bass in the dam but other fish such as carp, rainbow and tiger trout, catfish (barbel), Cape witvis and blue kurper as well. The dam is also used for sailing and with its surface area being 5100 ha there is plenty of space for this activity. There is however a small problem and that is the south east wind which can blow up a storm over the dam creating waves big enough to swamp small boats, so fishermen have to be careful when using boats on the dam. With all this action on the dam there is need for some control and this job is done by the sports club which is situated on a peninsula that stretches out into the dam. A nice feature of this dam is that access is not limited to a privileged few. The public are welcome to make use of the facilities and campsites around the dam. Of course its not free but one does not mind paying if you can relax and enjoy yourself.